Join us as we detail the journey these wild leeks make from the ground to your plate. Long before they appeared on restaurant menus, ramps were used as a spring tonic in the Appalachian Mountains. Because they are high in Vitamin C, ramps assisted in the prevention of scurvy and other nutritional deficiencies. After a long hard winter, ramps, just like fiddleheads, are finally beginning to pop up in the North. Grown across Eastern North America, including many parts of Canada, they are recognizable by one or two broad leaves measuring 1 to 2.5 inches wide and 4 to 12 inches long. 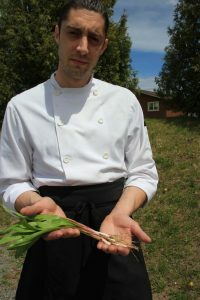 Also referred to as wild onions, ramps have become extremely popular, with festivals dedicated to them and chefs eager to incorporate the seasonal ingredient into their spring menu. They taste stronger than a leek, but are more garlicky than a scallion. In certain parts of the growing region, the ramp population has become threatened. It can take up to seven years for them to grow and so conservationists recommend foragers are selective in the harvesting process. We urge you do to the same. Ramps grow abundantly in certain parts of Northern Ontario, including Manitoulin Island where Stephanie Skilling lives in the summer months. She takes extra care in harvesting these and other wild edibles on the Island. The Island’s limestone creates a highly alkaline soil, perfect growing condition for ramps. Stephanie said ramps are typically out before the Trilliums bloom, but this year both have peeked out at the same time. For the last few years Stephanie has collected ramps, this year from a friend’s property in Sheguiandah, using them in her own cooking and selling a bundle to Verdicchio. If you can’t make it out to the restaurant to enjoy, try making the ramp pesto below. 100 grams extra virgin olive oil. We recommend our brand! Directions: Blend ingredients in the food processor and make sure to don’t heat up the ingredients too much in order to keep the flavour! Cool in the fridge. Enjoy!